The oldest competitor is George Ellison from England who is attending the festival for the first time. He is 81. Our youngest, Viviana Galván Cipriani, from Spain, is only 9. There are players from Mongolia who have made the journey: our first ever participants from this nation. Six Chinese are taking part, including 14-year old Wei Yi, already ranked number ten in his country, as well as last year’s top female, Zhao Xue. The 2013 champion, Nikita Vitiugov, whose exceptionally cool nerves under pressure led Grandmaster commentator Simon Williams to dub him the ‘Iceman’, also returns to the Rock, as does Nigel Short, who so nearly won again last year. Michael Adams, UK number one and world number 13, will have his own ideas about the destination of the £20,000 top prize, as will Vassily Ivanchuk, from the Ukraine, who holds the Gibraltar record score of 9/10, set in 2011. Former Russian women’s champion Natalia Pogonina, who has over 100,000 Twitter followers, makes her second visit. She tweeted favourably about Gibraltar recently. As always the week will be jam packed with surprises always in a friendly, family atmosphere which has made the tournament unique in the world. For all information, as well as live commentaries, Masterclasses, and interviews, the dedicated festival website, powered by Gibtelecom, is www.gibraltarchesscongress.com – well worth checking out on a daily basis. The festival venue is the Caleta Hotel. The festival closes on Thursday, February 6th, with a banquet and prizegiving ceremony. Chess Grandmasters have travelled from all over the world to participate in this year’s festival which is sure to be the best yet. This year there are players from countries including China and Mongolia. The good news is that the competition not only keeps on getting stronger each year but the numbers also keep on increasing. 2014 has seen a record number of entries in the Amateur and Challenger tournaments played each morning throughout the festival. This year in both the first and second week of the festival entries stand at around 130 players. Many from Spain, Portugal, Norway and of course Gibraltar. The first move in the Amateur and Challenger tournaments which began today was carried out by two of the youngest members of staff at Gibteleco. Rachel Holgado a regulatory officer and Craig Lima, an apprentice. The young chess player is Irene Nicolas Zapata from Spain who recently won the silver medal in the under 16 category at the World Youth Championships. The Masters tournament running simultaneously over the 10-day festival starts tomorrow Tuesday at 3pm. 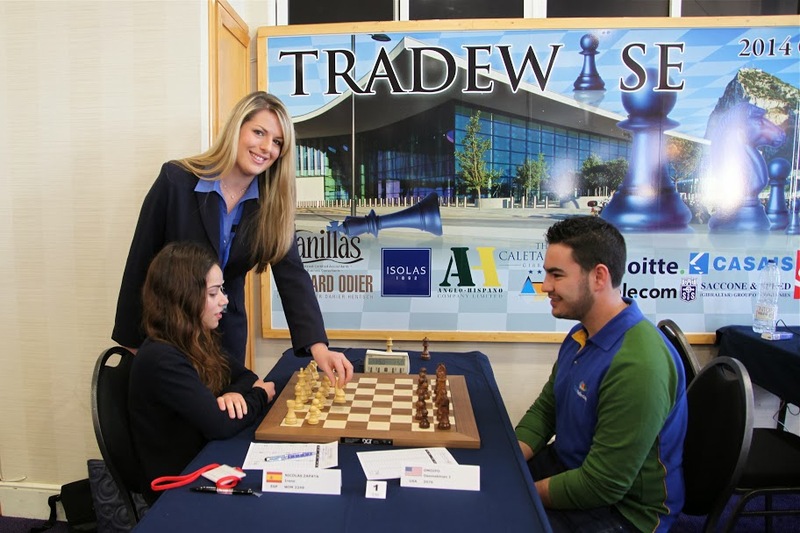 Tradewise Gibraltar Chess Festival 2014 LIVE!